Kanakadhara is a Stotram or hymn. The word ‘Kanakdhara’ is derivedfrom two Sanskrit words, Kanak meaning gold and dhara meaningflow. Thus, the word Kanakdhara literally means flow of gold. Thereis deep meaning and legend attached to the word Kanakdhara. AdiSankara, a renowned theologian and a great Hindu philosopher hadtaken Sanyasa at the young age of eight. One day, while he waswandering door to door for gathering alms, he reached a very poorBrahmin lady’s house. Adi Sankara asked the lady to offer him almsunaware of her financial condition. The lady searched her house twicebut failed to find anything edible that she could offer to Adi Sankara.Somehow, she managed to find one Indian gooseberry (amla) andoffered it without hesitating to Adi Sankara. On seeing this selflessdeed Adi Sankara was moved sang 21 hymns praising GoddessLakshmi. Pleased with Adi Sankara’s devotion, Goddess Lakshmiwas pleased and appeared before him and asked him the reason forcalling Her name out with such pure devotion. Adi Sankara instantlyasked the Goddess to grant the poor woman riches and bless her withabundant wealth. The Goddess first hesitated as the woman had notany good karma in her past life but learning from Adi Sankara whatthe woman had done and how selflessly she offered him the only fooditem she had in her house, appeased the Goddess. Goddess Lakshmiimmediately blessed that Brahmin woman by showering goose berriesmade of pure gold. Thus, the twenty one stanzas of Kanakdhara stotrabecame popular and are now chanted by all the devotees. Kanakdhara Yantra can be installed in pulja altars, cash box andalmirahs. Kanakdhara Yantra is a medium through which you can obtain theblessings of Goddess Lakshmi, the Goddess of Wealth. 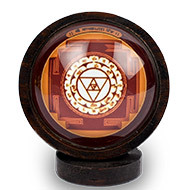 This Yantra isone of the most powerful Yantras that help remove poverty, cleardebts and attracts abundant wealth. The Kanakdhara Yantra alsooffers success in business. 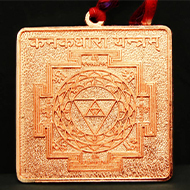 This divine Yantra prevents losses andremoves all the hurdles that block the path of money inflow. TheKanakdhara Yantra can be installed in puja altars, cash box andalmirahs. The powers of a Yantra thrive on the reverberation of cosmicenergies. When you focus at the centre of a Yantra, your mind ispitched into the creative force of the Yantra through which the energyflows. It is always important to install the Yantra in the correctdirection. Yantra holds strong vibrations which emits positiveenergies in the location where it is installed. Whether you place it atthe entrance of your home/office/shop or whether you install it in yourliving room or reception or study room or office cabin, the Yantra fillsthe ambiance with pleasant and positive vibrations. You can alsoplace it on a table or hang it on the wall. The best place to install theYantra is in the East direction facing West. The Yantra gets energisedby rays of the rising Sun. Also, the divine vibrations of the Eastcorner offer positive energies to the dwelling through its mysticalgeometry. When you look at the Kanakdhara Yantra, you will notice certainsymbols that are engraved or printed on it. This Yantra featuresCircles which are known as Chakras, lotus petals known as Padma,and the inverted triangles known as Shatkona. The Chakras representsthe rotation which is central to the functioning of the macrocosmicprogression. Similarly, the circle denotes perfection and the peacefulcreative void of the Vishudha chakra. The circle represents the AirElement. The Padma (lotus) is considered to be the divine emblem ofpurity that resides in the chakras. A lotus in Yantra represents theunconditional force of the Supreme Absolute Truth. The lotus servesas a divine seat for devas (gods). It also represents detachment. Itgrows in the mud but never touches even a tinge of mud, representingdetachment to the external forces (material world) and maintainingthe original nature which is pure and divine. The Shatkona is anarchetypal amalgamation of two triangles structured in all the Yantra.It characteristically signifies the divine unification of Shiva (Maleenergy) and Shakti (Female energy) which is the cause of all creation. Bestows Asht Riddhi and Nav Sidhdhi. "Om Hreem SahastraVadane Kanakeshwari SheeghramAvatar Aagachh Om Phat Swaahaa"
Purify your body by bathing and start with a positive, clear andfocused mind frame. Light the ghee lamp (diya) and incense sticks. (It does notmatter how many you light). Now offer fresh flower and fresh fruits to the yantra. You canplace the flowers and fruits on the altar. Now, take some water in a leaf and sprinkle it on yourself andon the Yantra. Now close your eyes and concentrate on the deity to bless you with wishes. Now with all sincerity, ask God to fulfil all your desires. To attract good fortune and to get rid of debts. "Om Hreem SahastraVadane Kanakeshwari SheeghramAvatar Aagachh Om Phat Swaahaa". I am really grateful to you. Although I purchased a small Kuber pendant in copper, I was really satisfied. I requested to send me an extra string which this company has rightly did. Moreover it was energized too as I could rightly get the fragrance of typical Puja and Havaan. Thanks again. This goes in to show the best practices followed by this company. Good luck. Thank you for the speedy delivery and the kindness that went into this shipping. The Yantras as beautiful and of a pristine quality. You even gave me a free gift! I will most certainly buy from you Centre in the future and recommend it with great confidence. I have been using Shirdi Sai Yantra (EP514) for over two years now. It has helped me to achieve god's grace and also protecting me and my family from black magic and evil energies put on us. Thanks a lot for the excellent product. I would recommend it for all Sai devotees. I have bought so many pooja items, gemstone god's statues, gemstone rosaries. All the products are excellent and is of great help for my daily pooja. All the products have been shipped on time and packed in an excellent way. I purchased several products from rudraksha ratna. For eg. I ordered kanakadhara yantra. They sent me by performing puja. Now i am purchasing gold atleast twice in a month. Thank you. My Yantra and rudraksha bracelet were beautifully packed and very elegant pockets were provided with them, not to mention the leaflets with guidelines as well, very useful. I am amazed by the quality and the care that you bring to the packages and by the perfect timing of it all. Thank you very much ! Great service and fast delivery. Nicely packaged vashikaran pendants are top quality and the included yantra booklet really informative. Very impressed. Many thanks.